The staple of our outreach program at SXSW was a four-story-high, tennis court-sized, full-scale model of the James Webb Space Telescope that uniquely conveys the engineering challenge of building this telescope. Thousands of people visited the model and interacted with Northrop Grumman engineers, Space Telescope Science Institute and NASA scientists, and more than 20 undergraduate and graduate students from the University of Texas at Austin’s astronomy department. The model piqued people’s curiosity, motivating questions like “Why is it important to cool the mirrors and instruments?” “How will something the size of a tennis court be launched into space?” “How will we communicate with the telescope?” and “Why are the mirrors colored in gold?” The public was expressing a genuine interest in this engineering marvel. The most frequent question I received was about the unconventional shape of the telescope and the purpose of the huge “sail” under the mirrors. Walking guests around the model, I described the sunshield’s role in cooling the telescope’s mirrors and instruments. The bottom layer of the sunshield, which will always face the sun, Earth and moon, will have a temperature of 85° Celsius (185° Fahrenheit). Each successive layer is cooler, with the top side reaching a chilling -233° Celsius (-387° Fahrenheit). The experience served as an effective gateway to our comprehensive interactive education and outreach effort. Adjacent to the model, we built a NASA Experience tent, staffed with personnel from the Space Telescope Science Institute, NASA, Northrop Grumman, Ball Aerospace, ATK Aerospace, Microsoft Research and UT Austin. Inside, local schools featured their own Webb telescope STEM projects, and families took pictures with an infrared camera and saw heat radiation. The same people asking about the sunshield and structure of the telescope outside touched and felt real telescope hardware, and people witnessed the full size of the primary mirror through a mirror exhibit. Microsoft Research’s World Wide Telescope group displayed a 20-foot-wide visualization wall on the back side of the tent, and dozens of professional astronomers gave more than 60 15-minute science and engineering presentations over three days, including custom-built tours and Skype chats with engineers in the Goddard Space Flight Center clean room, where real telescope hardware is currently being tested. These tours showcased the nature of the universe by panning through our solar system, circling around our galaxy and zooming in to the deepest images that we’ve ever obtained in astronomy (like the Hubble Ultra Deep Field). We described our current knowledge of astrophysical processes and highlighted the need for the Webb telescope to make the next leap in our understanding of galaxy formation, galaxy evolution, star and planet formation, and exoplanet habitability. Among the most popular lectures were those by Nobel laureate John Mather and Space Telescope Science Institute Director Matt Mountain. The tours also described the engineering behind the Webb telescope, such as how the telescope would neatly fold up to fit inside a rocket for launch and then deploy (i.e. transform) in space. For hours at a time, hundreds of people from the SXSW crowd were fully engaged in the action-packed World Wide Telescope tours. Some of the post-presentation Q&A sessions even lasted longer than the tours themselves. As a scientist, it’s extremely rewarding to work on the development of a telescope like the Webb because I am driven to solve the mysteries of the universe. Seeing this telescope launch in October 2018 will truly be one of the happiest days of my life. But the project as a whole is much more than that. On the last evening of our event, Northrop Grumman Aerospace Systems President Tom Vice spoke to an engaged crowd gathered around the Visualization Wall and captured what the Webb telescope truly is. He shared the scientific vision that led to the telescope, highlighting the enormous challenges facing the engineers who were tasked to go out and build this telescope at that time: the fact that we didn’t have 10 technologies that were needed to enable the project. He described the collaborative work of more than 1,200 skilled workers to embrace this problem and to innovate solutions. All 10 of these technologies have now been developed and have led to enormous spin off applications in the medical, aerospace and semiconductor industries. As Vice stated, the science, technology and engineering behind the Webb Telescope are the epitome of STEM. Over the course of three days at SXSW, our team shared the telescope with more than 10,000 people directly and reached millions more through social media. For me, the most rewarding aspect of SXSW was the spark that I saw in so many youngsters as I talked to them about the Webb telescope. Our event broke a barrier in how to do STEM effectively; we gave people of all ages and entire classrooms full of children access to dozens of scientists and engineers who could satisfy their curiosity, with the backdrop of an amazing, real-life STEM project. These students — our next generation — are not only the users of the Webb telescope in the 2020s, they are the creative vision behind our next bold adventure. If Hubble is any example, the discovery potential of the Webb telescope cannot be overstated; it may turn up more questions than it answers. 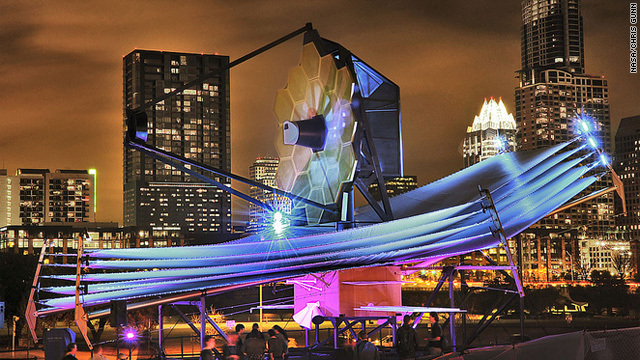 The collaborative James Webb Space Telescope event at SXSW was led by Alberto Conti and Stratis Kakadelis (Space Telescope Science Institute), Blake Bullock and Christina Thompson (Northrop Grumman) and Amber Straughn (NASA/Goddard Space Flight Center). Thankyou for all your efforts that you have put in this. very interesting info . "I am the wisest man alive, for I know one thing, and that is that I know nothing. (Plato's Apology)" by Socrates. Being an astrophysicist I have been working on developing a microtelescope. It's a small pocket sized telescopic viewer that lets you view images up to 40 light years away. Based on the scientific principles of Newtonian physics and parabolic theory it should allow us to explore space in a more geometric manner. Please make sure to do all the checks, and do them right!!!! Let's not have another problem like the Hubble's lens being out of focus. If I were to talk about the long term future of space telescopes (25 years and beyond), and also compare the telescope missions with some other missions studying the possibility of interstellar travel, what do you think is a better idea? Specifically, what is more feasible and desirable - building a giant 10 km dia space telescope or developing a space ship capable of interstellar travel? How might a telescope of 10 km aperture diameter be built? Can we mass produce 100s of thousands of small high quality mirrors and align them perfectly in the zero gravity of space? What could it reveal? "Just as Hubble and other NASA Great Observatories have answered questions about the universe, they have also revealed new mysteries." Since we now know that 'human spaceflight' is indeed impossible due to reentry physics that causes rapid vaporization at hypersonic (i.e. a meteor), hence the 'space race' was nothing but a mater-minded con leading up to the fake lunar landings inside the rickety tin-foil 'lem', then indeed the Hubble answered no mysteries, nor raised any new questions. The only thing the photo-shopped 'images' the Hubble have created, is false science intended to dupe the masses with 'astro-evolution', the Big Bang false doctrine as well as the non-scientific Copernican myth, all intended to 'destroy' Biblical truth. Yet ironically, the opposite will soon occur, or "the fall of Babylon" leading to the full exposure of evolutionary fraud (which, of course, evolution is 100% false on all accounts). NASA = Apollo = Satan, i.e. Revelation 9:11 has been fulfilled. You're a bit too obvious with your trolling attempt.